“There’s nothing as sweet as time shared with a friend.” Indeed! Soft vintage curtain with strategic tatting features this slogan that used to be a tea towel. Full, pleated skirt, short puff sleeves, round collar in oh-so-different fabric (look closely), elasticized curved pockets. 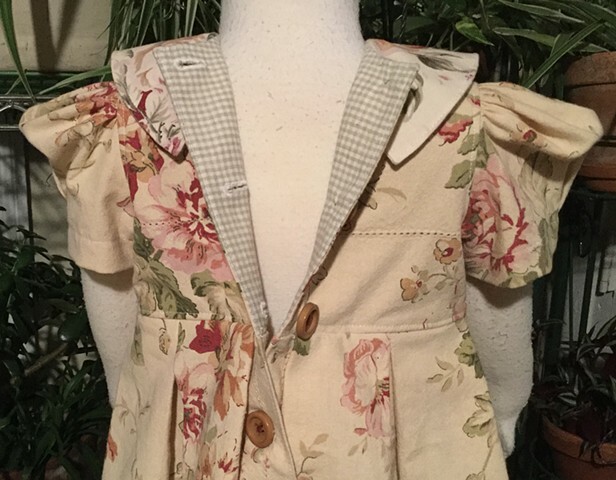 Closes all the way down the back with caramel-colored buttons, size Pre-School (3-4 years), measures 22” waist, 18” length, $70, 100% cotton, made by the designer herself and shipped free to any address in the U.S.